American DJ is doubling the “fun factor” for DJs, mobile entertainers, small clubs, bands and roller rinks with an exciting new fixture that combines 2 effects in one unit. Aptly called the Fun Factor LED, this easy-to-use, affordable fixture includes both an RGBW LED moonflower and a white LED strobe –giving users the ability to create a multifaceted, mind-blowing light show, without having to purchase and transport multiple fixtures. 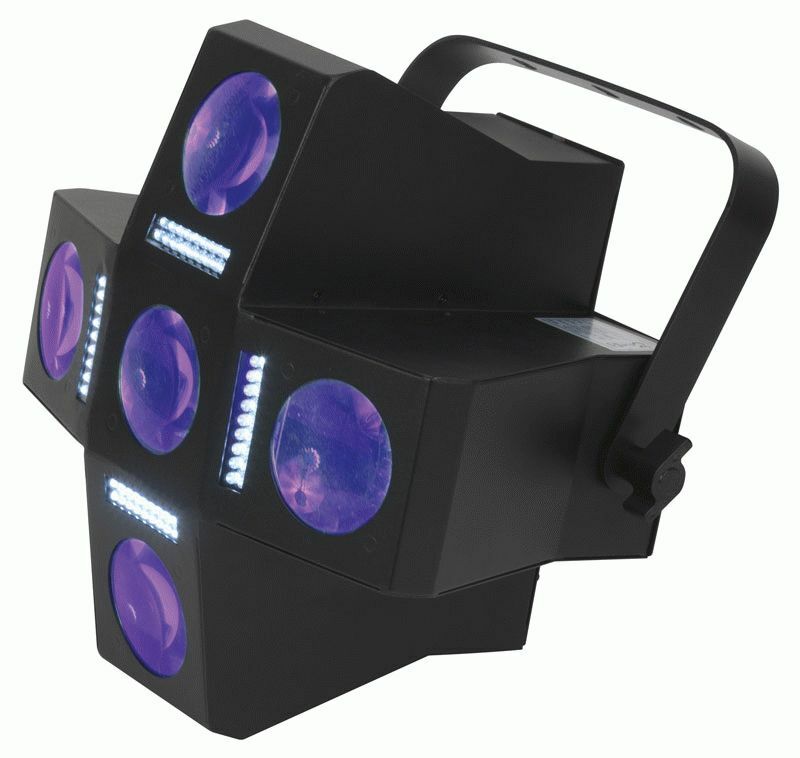 Featuring a total of 5 lenses and 4 strobe strips, the Fun Factor LED uses more than 280 LEDs to cover a large area with dancing circles of intense color and mesmerizing strobe action. Its moonflower effect is powered by 210 LEDs — 60 red, 75 green, 45 blue and 30 white — that cast dancing, sweeping circles-within-circles of deep, rich color over a wide area. Its strobe effect utilizes 72 white LEDs to generate brilliant flashes of light that instantly transform any dance floor into a hypnotic, slow-motion wonderland. Both effects can be used together or independently of each other to create one truly awesome light show. The latest in American DJ’s lineup of multi-effects lighting fixtures, the Fun Factor LED has an attractive list price of only $279.95. It represents a major value for budget-conscious lighting users who seek to make a big impression but don’t want to break their wallets or deal with an entire van full of expensive, heavy equipment. “Lighting customers, like everyone else, are looking to stretch their budgets today, which is why American DJ has had such overwhelming success with fixtures that contain multi effects on one unit,” said Alfred Gonzales, National Sales Manager for American DJ. “Multi-effects fixtures offer great value and convenience, and we will continue to offer innovative new products in this category like the Fun Factor LED. This affordable two-in-one lighting solution will pump up the fun big-time, and offer extraordinary performance and versatility at an amazing value. It’s perfect for DJs, clubs, bands and mobile entertainers who need a big light show but are operating on a small budget. It’s even great for roller rinks, indoor playgrounds and other places of amusement where simply having fun is the most important thing of all.”It’s even fun to operate this incredibly versatile fixture, which features a 4-button menu system LED display that makes it incredibly easy to navigate. The Fun Factor LED runs in 3 operational modes: DMX Control, Master/Slave and Sound Active. The unit provides several exciting built-in programs when operated in Master/Slave and Sound Active modes, and you can use American DJ’s UC3 controller (sold separately) to turn the Fun Factor LED on/off and scroll through all the different programs. For an even greater factor of fun, up to 17 Fun Factor LEDs can be power-linked together via the unit’s convenient IEC AC in/out connectors. The fun can go on all night without interruption, too, because the Fun Factor LED’s 282 cool-running LEDs never get hot, so the unit doesn’t have to shut down for duty cycles. Rated at 50,000 hours, the energy-efficient LED lamps will never need replacing. The compact and lightweight Fun Factor LED measures 12"L by 12"W by 9"H (306mm x 306mm x 227mm) and weighs only 9 lbs. (3.8kgs). It comes with its own hanging bracket and safety hook for safe and secure mounting. The MSRP of the Fun Factor LED is $279.95.